Quang Binh is a province in the upper middle region of Vietnam. This province is known as nature painting with many majestic natural landscapes from rivers, streams, mountains and forests to beautiful long beaches. 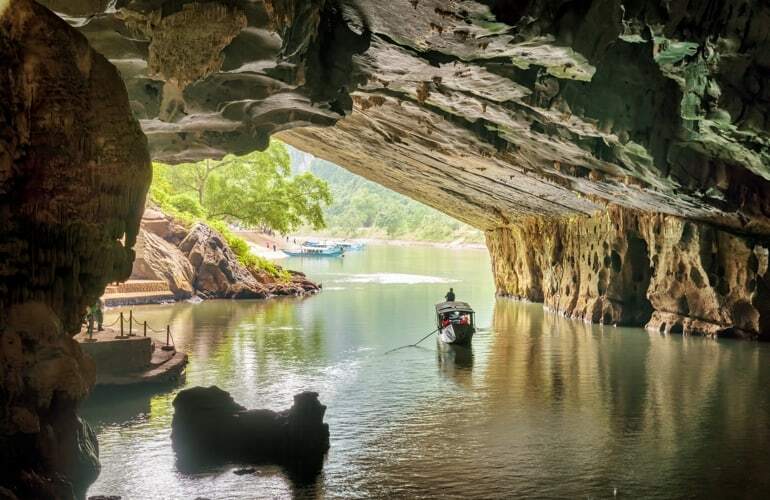 In addition, Quang Binh has a spectacular and immense cave system in the World Heritage Phong Nha - Ke Bang National Park area. This is one of the most ancient tropical limestone, the largest in the world with an area of over 200,000 hectares. It has a system of more than 300 large and small caves, in which you can find plenty of rare and attractive flora and fauna. 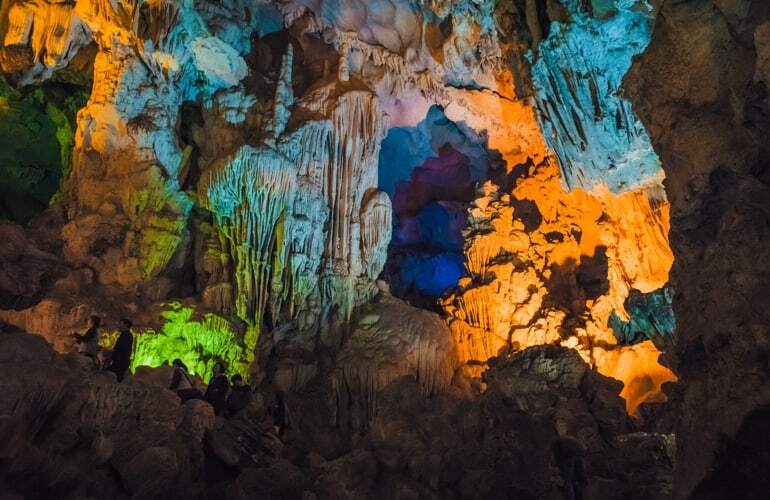 Quang Binh cave is attracting much attention of many domestic and foreign tourists. Let's explore the mysterious wonders of these caves! Phong Nha - Ke Bang is considered as a huge geological museum of value and global significance because of its complex geological structure, gathering various types of rocks such as sandstone, quartz, agate, stone lime silicon, marl, granodiorite, diorite, aplite, pegmatite… It also contains a complex, long-lasting geological history of 400 million years ago. The name of this cave means “Wind and Teeth”, or “The tooth of wind". It is said that in this cave, the stalactites radiate from the top to the bottom like big teeth and the wind blows constantly through the teeth. 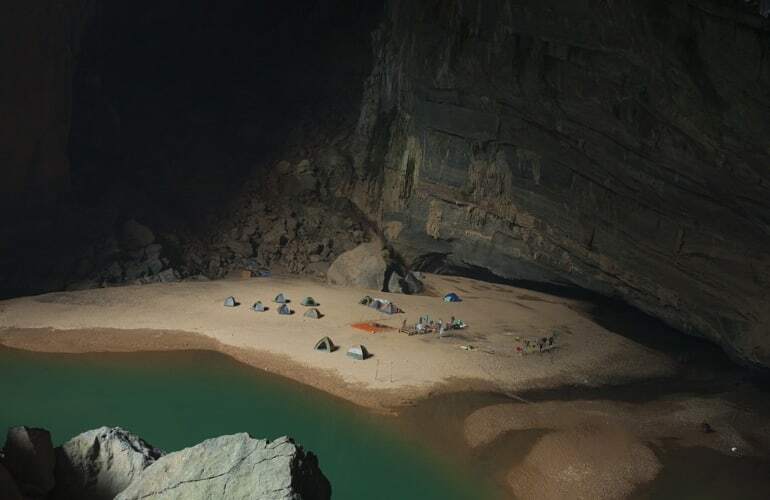 Phong Nha cave (Wet cave) is known as one of the most beautiful caves in the world. 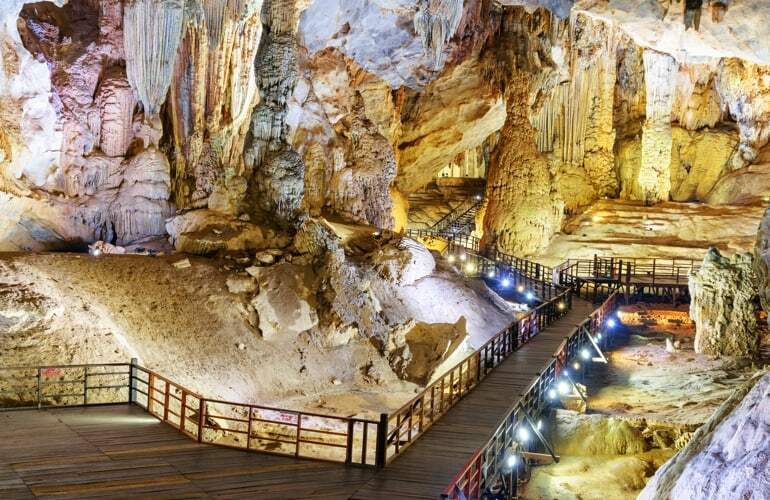 It measures 7,729 meters long and contains 14 grottoes, as well as a 13,969 meters underground river. Phong Nha is famous for unique stone blocks named after the natural shapes such as "Lion", "Royal Family", "Statue Buddha". 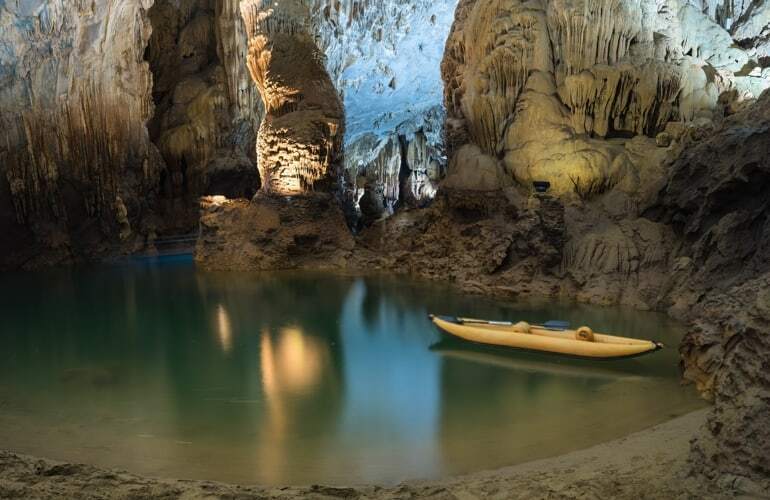 In fact, you will admire a great number of colorful stalactites with different shapes and the grandeur of the limestone corridor. Besides, at the end of the cave, you can find the characters and ruins of the Champa period. Tien Son Cave (Dry cave) hides itself in Ke Bang limestone blocks, under the majestic Truong Son mountain range. It is known as “Fairy on the mountain” was discovered in 1935 by a local. Tien Son cave entrance is about 1000 meters from Phong Nha cave on the top to 200 meters above sea level. With a total length of about 980 meters, Tien Son is considered as a castle of fanciful and colorful stalactites and stalagmites, along with the magnificent marble stone columns. Dubbed as the Royal Palace in the ground, Tien Son cave is one of the most beautiful and sparkling wonders in the world. 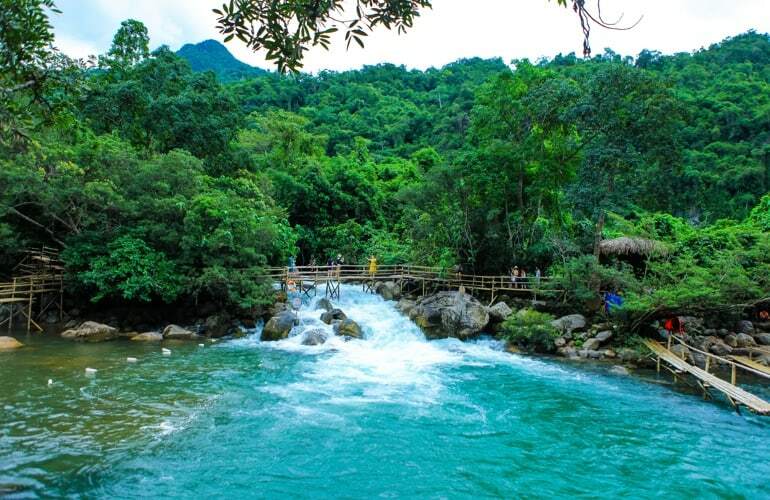 It is located in the heart of a limestone mountain at an altitude of 191 meters, surrounded by the primeval forest of Phong Nha - Ke Bang National Park. Thien Duong Cave is a dry cave that is considered to be the longest in Asia. Indeed, this cave has a length of 31.4 km, the width varies from 30 to 100 meters, the largest part is 150 meters long and the height from the bottom to the ceiling is about 60 meters. Hang En is a stepping stone to the legendary Son Doong cave. It possesses enormous size and great beauty. To get there, you will have to go through a large forest and cross a small stream before heading towards the cave. Inside of it, there are many rock niches, stalactites, the nest of thousands of bats and swallow and a green stream. This is the third largest cave in the world with rich and unique ecosystems. The cave has plenty of stalagmites and stalactites rising from the water as well as descending from above. The most distinctive feature of this cave is their antiquity. The stalactites and stalagmites are millions of years old. Moreover, they are covered by lush ferns - a rare sight compared to other places. 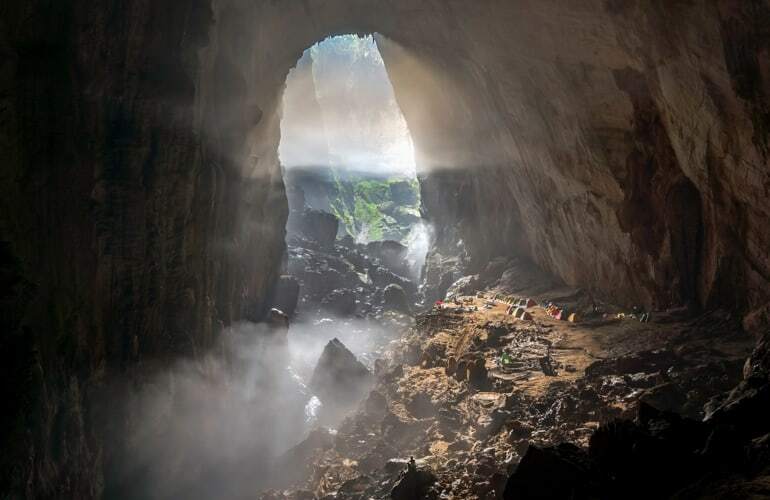 The Dark Cave is both wet and dry with a length of 5258 meters and a height of 80 meters. Additionally, it doesn't have lighting system even though its condition makes it a sensitive cave. Located 70 km northwest of Phong Nha cave, Tu Lan cave system includes 8 caves. You have to walk through a forest, wade streams, and face other difficulties to reach the cave. Therefore, take with you extra clothes because you will have to swim in the dark cave to admire the unique beauty of five adjacent caves.